CION je broadcast 4K/UltraHD a 2K/HD produkční kamera od AJA. Záznam do střihových "direct to edit-ready" Apple ProRes 4444 až do 4K 30fps, ProRes 422 až do 4K 60fps, nebo výstup v AJA Raw až do 4K 120fps. CION má unikátní nádherný design a vyjímečnou funkčnost. Špičková optika, kvalitní 4K CMOS snímač 22.5x11.9 mm, PL lock, 4x3GG-SDI hlavní výstup, 2x 3G SDI monitorovací výstup, 2x HDMI. Standardní příslušenství: držadlo, standardní zadní desku, montážní sada pro držadlo, alternativní desku na zadní část, LANC přírubu, desku pro adaptér baterií, LANC kabel, napájecí zdroj. CION can record at 4K (4096x2160), UltraHD (3840x2160), 2K (2048x1080) and HD (1920x1080). 2K and HD are hardware scaled from the full 4K sensor, resulting in beautiful over-sampled images, which also retain your lens’ focal length at any desired resolution. Frame rates up to 50 and 60p are supported - even at full 4K resolution. 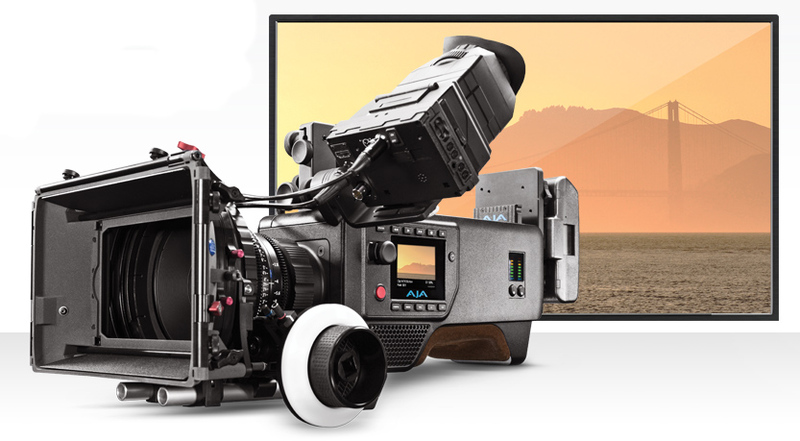 CION is also fully capable of outputting frame rates up to 120 fps as either 4K or UHD from its 4 x 3G-SDI outputs as AJA Raw. 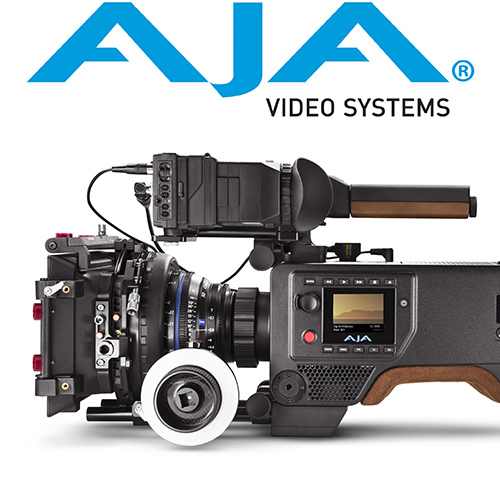 AJA’s Corvid Ultra in conjunction with TruZoom™ software can take the AJA Raw output and replay it at up to 60 fps. Output up to 30fps AJA Raw via the Thunderbolt™ connector. CION can also record HFR 4K 50 and 60p to Pak media, as Apple ProRes 422. 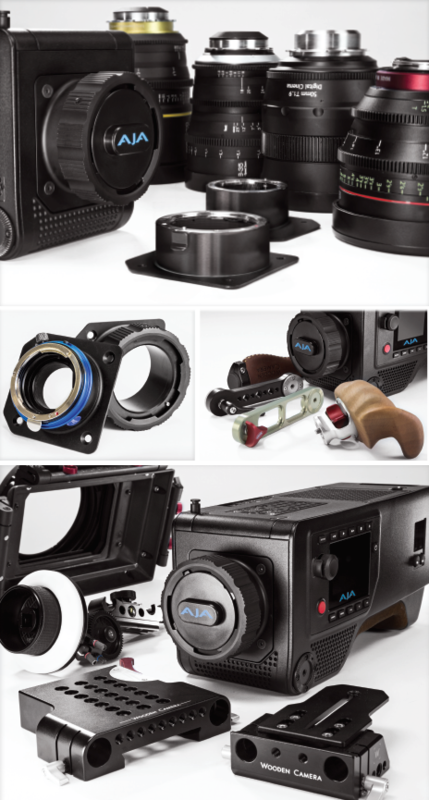 PL mount lenses are the industry standard for cinema and professional production cameras, and are widely available the world-over. In addition, CION’s lens mount has been designed to be removable so third parties may develop mounts for other lens types. CION also offers powerful network-based control. Via the LAN connection, a web-browser UI allows for remote configuration of the camera. Your CION is completely controllable whether it’s on a crane, jib or car mount from virtually any web browser. CION’s considered design brings ease of operation to both field and studio based productions. For single users, set up and operation is intuitive and straightforward. For more complex productions camera operators, camera assistants and digital imaging technicians may all interact with CION without conflict. In such a scenario, the camera operator can use one monitor output for framing, the camera assistant another monitor output for judging focus and the digital imaging technician can use yet another monitor output as well as the web UI to configure the unit. CION’s sleek chassis is formed of gravity molded magnesium which is lightweight but extremely strong. Integrated steel rosettes allow you to mount industry standard accessories including hand grips and handle extensions directly to the camera body. CION was designed to be comfortable, convenient and totally flexible for any shooting environment. A contoured shoulder pad fits comfortably to your shoulder for hand held use. This open system gives you immense flexibility no matter the shooting environment, both indoors and outdoors. From shoulder to tripod and from dolly to crane, CION keeps all of your options open. All of the audio and video connections used on CION are industry-standard and thoughtfully positioned. Audio and video connectors have been placed where they are unobtrusive to the operator. 3G-SDI and HDMI monitor outputs, as well as a power output, make monitor and viewfinder additions to CION easy to implement. Utilizing CION’s high-quality scaling capabilities, these dedicated monitoring outputs are always active even when working with 4K or Ultra HD. CION elegantly connects production and post with support for the Apple ProRes family of codecs. In 2007 AJA introduced the Io HD. It was the first device to offer hardware-based encoding of Apple ProRes. In 2009, AJA introduced the Ki Pro tapeless video recorder, the first camera-connected recorder to offer Apple ProRes encoding. CION draws on this distinguished history of support for Apple ProRes capturing vivid and detailed images that are easily manipulated in professional video editing and finishing applications. CION provides a multitude of on-set monitoring options for 4K/UHD and 2K/HD including a hardware dedicated down convert for 4K/UHD to 2K/HD. CION’s outputs are simultaneously live allowing great flexibility in any scenario independent of resolution. CION multicam shoots are straightforward to implement and manage by using a laptop with a simple ethernet switch and LAN cables. The web UI allows complete and independent set up of multiple CION cameras; you may name each camera and consolidate control of the cameras from within a web browser using the unique gang recording feature. The web UI will also allow realtime monitoring of the capacity of the Pak media used in each CION.